Yesterday, I featured Juan Alderete’s pedal board of The Mars Volta, so today I needed to follow up with Omar Rodriguez-Lopez. I have to admit, I didn’t know much about The Mars Volta, but after doing some research and listening/watching stuff, it really appears that he’s stripped down his rig from years past. 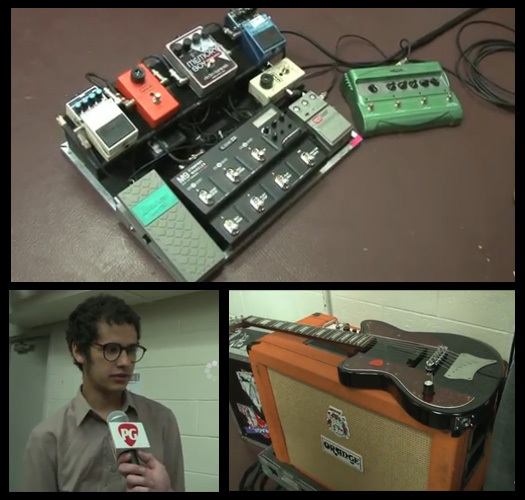 Premiere Guitar got with The Mars Volta while they were touring with Sound Garden to discuss the rig. Below is the break down of all the pedals shown on the board. I’m sure the Line 6 M9 helped him get things more compact. Sometimes I wish TMV would get back on the drugs then ditch the ‘scaled down’ bs. Any idea how Omar gets his octave effects? I agree, but they shouldn’t get back on the bad drugs, just occasional psychedelics to check in, and semi regular weed to not get too rigid mentally. I feel like after Bedlam in Goliath, Omar just lost inspiration or direction, and they tried to strip things down and simplify but it ended up just feeling like they were trying to be more marketable. The mindset Omar had during the Deloused era in an interview was that he had not much interested in catering to the masses, but felt musicians should push the boundaries and hit listeners up against the head. He said, otherwise how will we ever get to the future music?